2009 and 2010, I had the pleasure of attending Famous Smoke Shop cigar festival. I received so much “swag” it’s ridiculous! 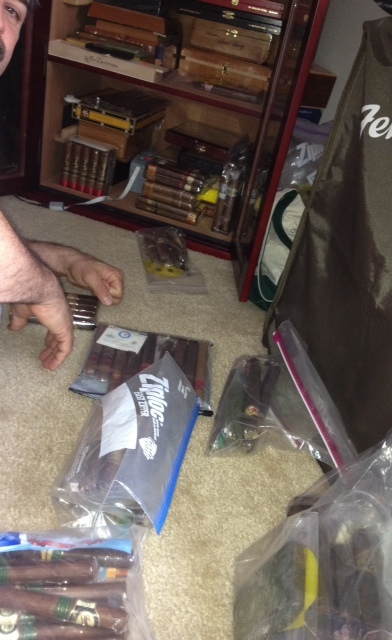 AVO, PERDOMO, ALEC BRADLEY, Flor de Gonzalez… (Just a tiny sampling). I still have cigars from the festival. 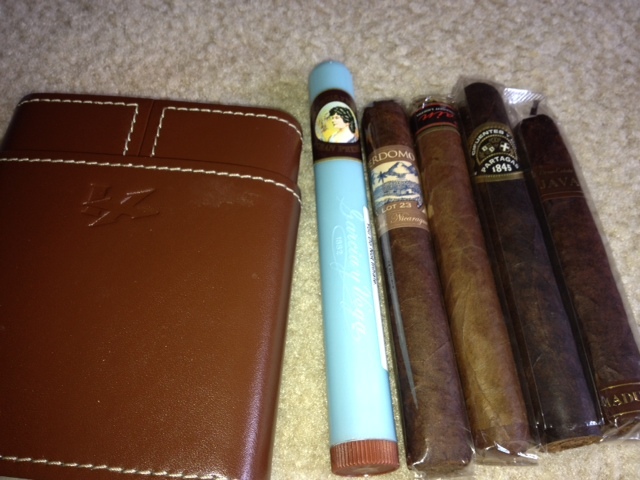 In the bottom of the barrel (humi-pak) was this pretty blue tube with a brunette smoking a cigar. I don’t let the chic in me make the decision based on appearance but I am intrigued. I take the cigar out expecting to find a dry, crackly wrapper (this cigar is at least two years old and has not been out of the tube). NOPE! Color is slightly green, “is it bad?” Sniff, (just like wine, it goes through the senses test), Oh?! This is a surprise; sweet aromas. “Brunette in the blue tube, you will be tasted today.” She’s placed in the traveling humi. 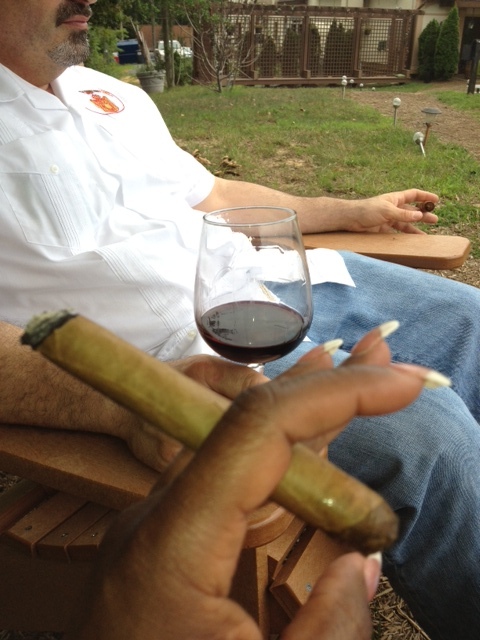 The Professional and I are at Potomac Point Winery on Humidor Hill. I pull out my odd color cigar with the light sweet scent. I place her to my lips, light, “Oh my, this is very nice!” She’s soft, mild, with just a hint of flavor, the aromas are pleasant. The taste isn’t sugary or heavy; enjoyable (nodding). From the group next to us, we hear a female says, “How come your cigar doesn’t smells like hers?” and “I will try a cigar that smells like hers.” I remember those days of only smoking flavored cigars’ and trading Perdomo Lot 23 for Acid Kuba Kuba (Shaking My Head). Don’t get me wrong, there’s nothing wrong with Acids. The point being made is, just like wine, beginners typically start off with enjoying the sweet flavors until their palate matures. I still enjoy my Kuba Kuba here and there and for dessertJ. So, I just smile and enjoy the company, scenery and this mild aromatic cigar that has become the center of attention. “Since 1882, Garcia Y Vega Gran Coronas Tubes Claro cigars have promised consistently smooth, mild taste in every cigar they make. 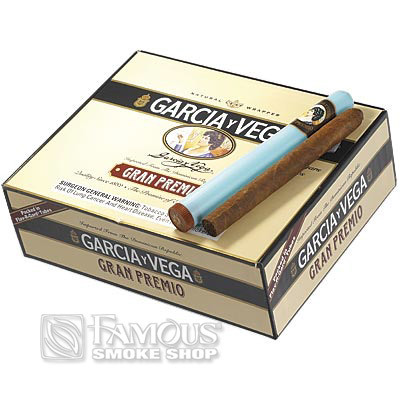 Garcia Y Vega cigars use carefully aged filler tobaccos and choice natural leaf wrappers to assure a cigar that’s always flavorful and aromatic. Available in a wide choice of sizes and natural leaf wrappers, these very popular cigars offer you a satisfying ‘everyday’ smoke at convenience store prices…” Retail Price: $57.99 box of 30, Famous Smoke cost: $48.99. Just seen one of these in a cigarillo size. Decided to buy as it was only 82 cents. Actually not a bad little cigar.